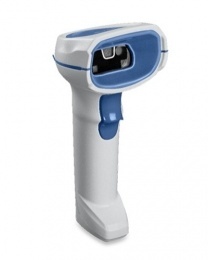 The DS8178-HC from Zebra is an extremely powerful 1D/2D area imager with an 800 MHz microprocessor. Together with the high-resolution megapixel sensor (960 x 1,280 resolution) and exclusive PRZM technology, the device provides secure scan results. The cordless device also easily captures problematic barcodes. Its internal diagnosis of the scanning performance ensures that no mistakes occur during scanning. Thanks to the proprietary Wi-Fi-friendly mode from Zebra, the device avoids Bluetooth interferences. This exclusive Zebra function ensures that the DS8178-HC only uses channels which the WLAN does not use. Even its battery assures secure usage. The clearly readable remaining charge display shows in an instant if a battery change is necessary before the end of the shift. FIPS 140-2 certification is especially important in the healthcare sector. It certifies that the DS8178-HC protects patient data extremely effectively. Additionally, the area imager’s housing is made of special plastic and covered screw holes, which prevents the spread of bacteria and allows for effective cleansing.